Size: Required Trial 2 lbs. 10 lbs. A healthy dog food recipe for making biologically appropriate pet meals. Healthy Dogma PetMix is the easiest way to cook for your pet and make sure they get all the nutrition they need. PetMix can be served cooked or raw, and is 100% Grain, Gluten, and Allergen free. If you are at all concerned with your own nutrition, you know that the more natural foods you can eat, the better you are. Research has told us that natural vegetables and meats promote a healthy lifestyle and reduce the risk of developing disease. If you have a dog, the same thing goes for him or her. They need natural dog food that isn't packed with unnatural preservatives, hasn't been treated with steroids or chemicals, and isn't packed with fillers like rice and grains, that only fill their stomachs, but don't give them the nutrition they need to stay as healthy as possible. Don't you want your dog to be as healthy as you are? Doesn't your faithful companion deserve the same nutrition as you? 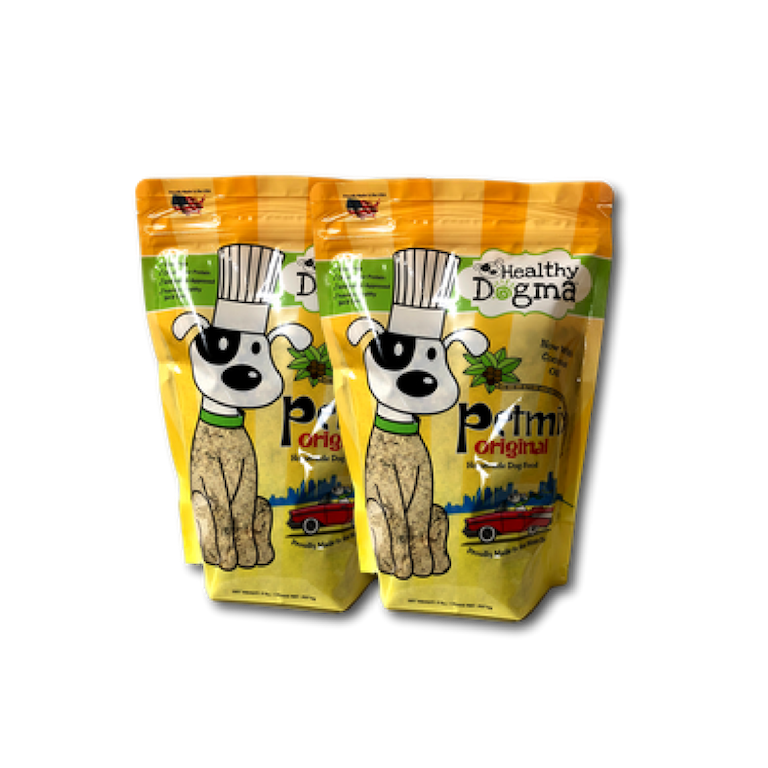 Give your dog healthy food like PetMix for a long life and happy life. A two pound bag of PetMix makes about 16 pounds of fresh dog food (raw or cooked). With Healthy Dogma PetMix, your dog gets the nutrients she needs - they are not lost through the manufacturing process. Plus, it is preservative and grain-free, which makes it easier for dogs to metabolize, due to the fact that they can naturally digest meat, not grains. Certain abnormal cells also use carbohydrates by taking amino acids from healthy cells, so feeding your dog grains over proteins allows abnormal cells to grow and inhibits cell repair. Unfortunately your dog will not get the high quality protein if eating commercial dog food, even premium brands, because they contain a large quantity of grains used to boost the protein level. If there is a fairly high percentage of "meat" in your current dog food, much of it, most likely, comes from spleens, feet, ligaments, intestines, and other sources generally not used for people. 1. Place meat in large pot. 3. Break up meat with spoon or potato masher. 4. Turn heat on low. Do not boil. Stir until meat browns. 5. Pour in PetMix, stir thoroughly. 6. Cool, then serve, refrigerate, or freeze. Make PetMix as directed and roll into balls, (I use a 1/4 measuring cup) to a desired treat size and place on a cookie tray. (Use wax paper if necessary.) Put the tray in the freezer. Once frozen these treats can be placed in plasitc bags. Dogs love these treats on hot summer days! My golden retriever and I love it! I mix with varieties of proteins and veggies and her allergies are so much better. My Frenchie could not tolerate kibble. Petmix allows me to add what ever meat and otgans I choose, with the peace of mind knowing there vitamins and minerals with a few added goodies in the mix. He does so well on Petmix. A life saver for my Frenchie. Have always fed this food to my dogs and they love it. It's easy to fix and I can control the protein. My 4 year old pit mix acts like a puppy at feeding time. I have golden retrievers and decided to add this to their kibble. They love it! The reason for the 4 stars and not 5 is I have not used it long enough to notice any health benefits like coat improvement yet. They are both healthy and I show both of them and I am hoping for some benefits with their fur. I can update later! My dog is very picky and he loves healthy dog am my dog is very picky and he loves healthy dogma! Thank you for and pure and whole product. This my second dog on you brand. I will never switch again!!! Great meal addition for my three BFs. They love it as a mix with dry food. I like the ingredients that satisfies my requirements for them. I was leary at first as there are so many natural foods in the market. Being in the pet industry I knew I had to make a change as the food my dogs were eating had too mnuch fat. My vet gave me Healthy Dogma..it has been heaven ever since...the love it..it is easy to prepare....to bad tummies..not too much pooping..and the are happy yorkies. Thank you Mary Beth and Tom for this product. Its not too hard...just heat up some white meat ground turkey in some water and add Healthy Dogma..and bingo dinner. My finnickey yorkies love it. I add a little warm water to it when I feed them and its great. Their poop is normal and only twice a day. This was the best find and I am in the pet industry. The jury is still out but so far so good! I've only been using the products for a week but so far so good. All three of my dogs easily transitioned to the new food with no stomach issues so that's always an added bonus!